Sustainable development is challenging all sectors of the construction industry to re-evaluate their energy and materials use, leading highway authorities and their contractors to recycle materials where possible, use cold-lay techniques, and minimise the use of salt for winter service operations. Recognising the importance of developing renewable energy resources, the Highways Agency commissioned the Transport Research Laboratory to explore available methods and assess the possibility of renewable energy generation being exploited within the highway network. One of the techniques recommended for investigation was the use of Interseasonal Heat Transfer which incorporates solar energy collectors in the road and shallow insulated Thermal Banks in the ground. This versatile technique invented by ICAX Limited, primarily to heat and cool buildings, is innovative and at the forefront of technology. 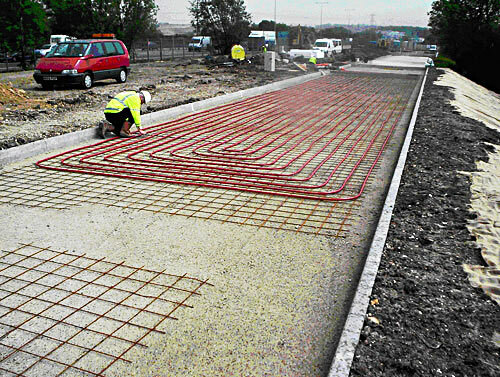 In summer, the sun’s heat absorbed by the road surface is collected by fluid circulating through arrays of plastic pipe installed at shallow depths below the road surface and transferred to insulated heat stores in the ground. This heat remains stored in the Thermal Banks ready for recovery in the winter for preventing icing of the road surface or for heating nearby buildings. A major instrumented trial of the technique was undertaken on an access road near Toddington. It involved constructing two solar heat collectors (pipe arrays each 5m wide by 30m long installed at 120mm depth below the road surface) and two insulated thermal banks of similar dimensions but at 875mm depth. 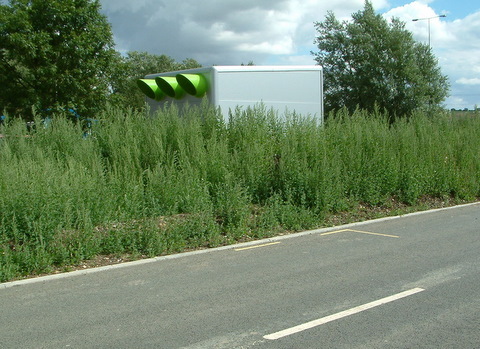 One thermal bank was created beneath the road to simulate new construction and the other beneath the verge to simulate a retrofit installation. Each thermal bank and each collector pipe array is the same size (5m × 30m) and comprises 25mm diameter cross-linked polyethylene pipes with a spacing of 250mm between adjacent longitudinal pipe runs. The collector pipes were tied to a steel square mesh prior to placing a concrete screed, followed by the asphalt binder and wearing courses. The store pipes were placed directly onto the underlying clay surface. To prevent heat loss an insulation layer of 200mm expanded polystyrene was placed directly over each thermal bank. This insulation layer extended 6m beyond the edges of each thermal bank to prevent heat loss from the surrounding ground. a weather station to monitor solar radiation, rainfall, humidity, temperature, wind speed and direction at the site. The first full summer of heat collection occurred in 2006. During July 2006, when the air temperature peaked at 34°C, a peak road surface temperature of 50°C was recorded. At this time, the temperature of the operating heat collector array reached 38°C. 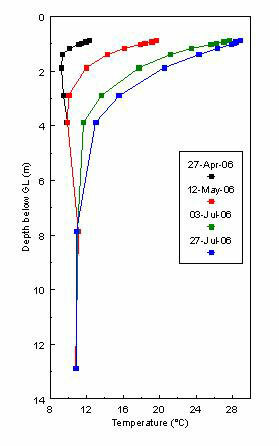 The build-up in the temperature of the ground with depth below the thermal bank pipe array during the summer of 2006 shows that maximum ground temperatures of 29°C were reached in July 2006. Increases in ground temperature occurred at depths of up to 4m within the thermal banks, although very small changes in temperature were measured down to about 8m depth. It is this heat stored in the thermal bank, contained by the insulation, which is retrieved in the winter for heating purposes. During the full summer of heat recovery in 2006, measurements showed that up to 6.5MWh of heat energy could be recovered from solar heating of a 150m² area of road surface and stored in the thermal bank for re-use. Operating from this fully charged thermal bank, winter maintenance of the road was carried out in 2006/07. When the road surface temperature fell below 2°C and the heating was activated, this section of road was generally maintained at a temperature about 3°C hotter than that of the unheated control area. The heated area of road remained above freezing except for a few hours of extremely cold weather in early February 2007. On 7 February extreme surface temperatures of -6°C and -3°C were measured for a few hours on the unheated and heated sections respectively. The following morning snow fell and briefly settled although the road surface was being maintained between 0°C and +0.5°C at the time. Apart from this one incident, no other issues were encountered in keeping the road surface above freezing. Salting took place on the nearby M1 motorway 28 days that winter and heating was activated automatically on 16 more days than this. Further tests would help to refine the parameters used for triggering surface heating and to conserve heat for more extreme temperature conditions. Numerical modelling suggests that a significant improvement in winter maintenance performance would be likely if the heat pipes below the road surface were at shallower depths of cover than the 120mm used in this study. Following an examination of the whole life costs of operating a winter maintenance system (incorporating summer heat recovery) it was suggested that treatment of well-known cold spots on the highway network or treatment of slip roads and interchanges may provide cost effective locations for initial implementation of Interseasonal Heat Transfer systems. There may be merit in looking at other forms of heat storage using borehole heat exchangers so that land-take would not be an issue as the boreholes can then be sited below the road structure without requiring insulation. An investigation of the performance when heating a nearby building using Interseasonal Heat Transfer was also carried out. Solar heat recovered during the preceding summer was used in response to the simulated demand for building heat from December to April. This simulation protocol extracted heat from the thermal banks, and delivered it (via a heat pump) to a buffer vessel. The buffer vessel simulates the heat load of a building by losing heat to the atmosphere at a rate determined by a pre-programmed look-up table. During this experiment about 4MWh of heat was used in the building heating simulation and of this about 90% was extracted from the heat store prior to boosting the fluid temperature using the heat pump. Some electricity was used to drive the pump circulating fluid from the heat store to the heat pump, and the heat pump itself, and this was taken into account in evaluating the performance of the system. The procedure used for the building heating simulation was effectively reversed to simulate cooling of a building in the summer. The ability to cool a building is an important feature of the Interseasonal Heat Transfer system in view of the increased temperatures likely in extended summer periods due to global warming. During the four months to August 2007, about 10MWh was extracted from the simulated building and successfully transferred to one of the thermal banks. It was concluded that there are significant advantages in providing a self-sufficient building system incorporating both heating and cooling. In this way heat recovered during the cooling period can be re-used for building heating purposes in the winter. 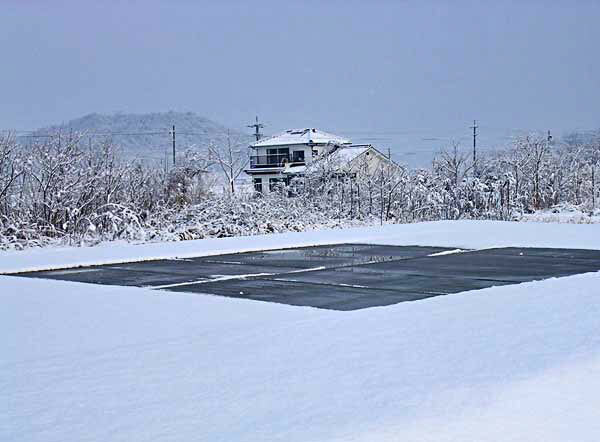 During cold summers when building cooling is not recharging the ground store with heat, there may be merit in boosting the temperature of the ground store by recovering solar thermal energy from nearby asphalt surfaces such as the road, or even a car park. A detailed account of the design, construction, operation and performance of the instrumented test facility to recover heat from the road surface is available in TRL's published project report PPR302, Interseasonal Heat Storage. The performance was monitored over two years which gave the opportunity for full seasonal assessments of the recovery and storage of solar heat from the road surface, its re-use for ice-free winter maintenance of the road surface, and protocols simulating the winter heating and summer cooling of a nearby building. Numerical modelling and whole life costing of the recovery of heat for winter maintenance of a highway were included in the study. See Toddington Images of construction.